New regulations have been published in Venezuela allowing soldiers to open fire if they feel their lives are at risk during demonstrations. The rules specify a scaled approach to maintaining public order, up to and including the use of deadly force. 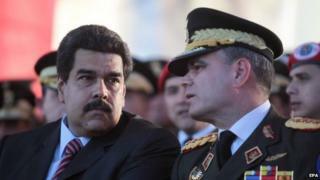 Defence Minister Vladimir Padrino Lopez said the changes were made in response to three months of violent protests last year. Citizen rights groups in Venezuela say the new rules are "dangerously vague". Mr Padrino Lopez said the aim was to establish a protocol to help train and improve troops' responses to public protests. But he said the rules had been written as "a profound response to human rights, to life and to protesters". The Venezuelan ombudsman, Tarek Williams Saab, said the regulations were "very clear on the progressive and differentiated use of force" and the aim was "to protect human rights and rights in demonstrations". He was responding to a series of criticisms from civic groups. Marcela Maspero of the National Workers Union called the plans "a direct threat to the working class. "It is the workers who have been the main participants in the social protests in the country in the last few years." She said the country was going through hard economic times, and there had been protests about the serious problems in the food supply chain and increases in the price of petrol. She felt the government was publishing these rules as "a warning" to the workers. Civil rights groups pointed out that the ruling was unconstitutional because the Constitution expressly forbids the use of firearms to control peaceful demonstrations. Rocio San Miguel, who works for the NGO Control Ciudadano (Citizen Control) was quoted by the French news agency AFP as saying it was right to regulate how soldiers behaved but the new regulations were "dangerously vague and controversial". The rules were published a few days before the anniversary of the start of three months of anti-government protests last year in several cities in which at least 40 people died, including police and protestors. How are Venezuelans coping with tumbling oil prices?